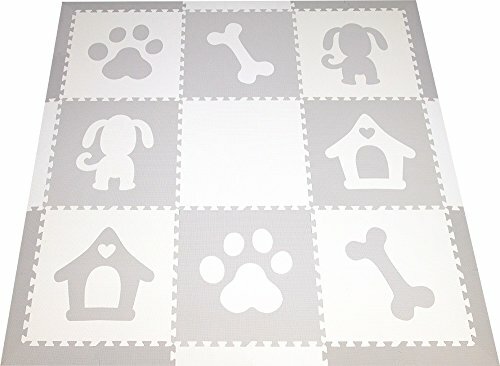 This SoftTiles Dog Theme children's foam play mat in Light Gray and White is a fun playroom or nursery floor for dog lovers. The soft neutral colors make it a perfect for living rooms and a baby's nursery. Create the modern designer playroom or nursery that you'll want to show off! The Dog Theme shapes in this play mat are very large. They are die-cut from our large SoftTiles 2 foot x 2 foot interlocking foam tiles. This play mat measures 6.5 x 6.5 feet (78 x 78 inches)- an area over 42 sqft. This is a nice sized play area for infants learning to crawl and toddlers starting to walk. In this foam tile set, you will receive 8 Dog Themed Tiles (2 Dogs, 2 Bones, 2 Paws, 2 Dog Houses) 24 sloped border pieces in light gray and white. The sloped borders are unique to SoftTiles and help provide a smooth transition from the mat to the floor. It helps prevent tripping and looks great at the same time. This set does not contain small pieces! SoftTiles are made in Taiwan from EVA foam and tested free of formamides, BPA, phthalates. Because the Dog Theme foam mats are die-cut, we do not recommend them for use on soft surfaces like carpet as the pieces can pop up when walked on. DESIGNER: Light Gray and White play mats have a soft neutral color that are perfect for any living room, playroom, or nursery. SOFT: SoftTiles playmats turn hard wood floors and concrete basements into fun playrooms. SoftTiles create soft cushioned surfaces that are perfect for infants learning to crawl and toddlers starting to walk.